Study Abroad on a Scholarship? The Weissman Center for International Business at Baruch specializes in assisting students with their goals to study abroad. With us, the process is made easier simply by crossing the plaza and speaking to a study abroad advisor. It is no wonder that students everywhere are drawn to the idea of studying abroad, as it provides students with an amazing experience that combines culture, self-growth, and academics. But four bright Baruch students were lucky enough to get that opportunity and more! Students Nora Hristova ‘16, Jonathan Morales, Pamela Ozga ‘17, and Ruth Laryea-Walker ’16 were all awarded the Benjamin A. Gilman International scholarship to study abroad for the fall 2015 semester. Nora received $3,500 and Jonathan was awarded $3,000, while Pamela and Ruth each received $2,500. Dr. Richard Mitten, the director of study abroad at the Weissman Center said, “The whole purpose of an exchange program is to give students the most cost-effective per credit opportunity to study abroad.” In doing so, the center looks for scholarships and opportunities to make the experience possible for more students. While many may think they can’t afford to study abroad, the Weissman Center always has opportunities to make the experience as affordable as possible. When you think of Facebook usage at work, you most likely associate it with being unprofessional, time-consuming, and unproductive. But that might soon be a thing of the past! Facebook has recently introduced the integration of social networking and business in a new platform called “Facebook At Work”; this specifically focuses on the social aspects of both Facebook and the workplace in order to maximize the efficiency and productivity of communication. But instead of being free-range, this platform allows you to communicate solely with your fellow employees. Your ‘friends’ are your co-workers, you share links, articles, and ideas, that are beneficial to the company, and you’re able to create private groups with your team to communicate about projects. But fear not, you will also able to link your personal and work accounts while keeping all posts separate. According to the Wall Street Journal, Facebook’s main selling point will be familiarity. In fact, Facebook has been using a similar way of communicating within the company and hopes to publicize its methods with Facebook At Work. The app is currently available for download on the Apple IOS and is in the process of being available for Android. And, because the program is still in testing, it is ad-free and free to use. However, pricing for the app may be discussed in the future. Currently, this platform is being tested by only a small number of companies. But, if you’re interested in creating an account of your own, find more information here on Facebook’s website. Baruch students know that succeeding in the art of entrepreneurship is tricky business- and global achievement may seem downright impossible. For female students this may be an even greater challenge, as the world of finance is dominated by males. 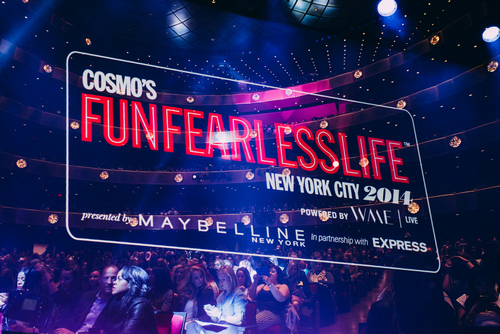 But at Cosmopolitan Magazine’s first annual ‘Fun Fearless Life’ convention, earlier this November, business belles such as Sara Blakey, Sallie Krawcheck, Aliza Licht, and Alexa Von Tobel, showed thousands of young women what it means to conquer. ‘Fun Fearless Life’ was a two-day conference meant to promote a healthy awareness and self-confidence in young women. Many experienced panelists spoke on a variety of matters: entrepreneurship, self-esteem, social media presence, motivation, fitness, and even relationships. What did they have to say? Sara Blakely, founder of Spanx, and 93rd most powerful woman in the world according to Forbes Magazine, happily shared the story of her success while encouraging women like herself to shoot for the stars. Her biggest bit of advice was to believe in yourself, and your product, but try to maintain a sense of security. She, too, gave Spanx her all, but it wasn’t until her 4th year of working at Danka that she finally resigned to fully commit to her brand. And although Mrs. Blakely is one of the world’s wealthiest people, she’s no stranger to giving back. In fact, the Sara Blakely Foundation makes a global impact by funding scholarships for young women in South Africa at the Community and Individual Development Association City Campus in Johannesburg. Alexa von Tobel, creator of LearnVest, a financial planning company, made a lasting impact on the audience by not only balancing financial awareness and responsibility but also merging the concepts of saving for the future and having fun today. In her words, “Money should be a tool- it shouldn’t be worshipped and it shouldn’t be ignored.” Ladies, you can now breathe a sigh of relief. With the proper knowledge, and tools, it is possible to save for your future and not miss out on the social life you might have been holding back on. Aliza Licht, the SVP of global communications at Donna Karan International and DKNY PR GIRL, was labeled one of the 50 Most Powerful Women in New York. Her “award-winning social media personality” may have captured the attention of many DKNY customers but it has also made an impact on many of the listeners at the conference. So, for those of you that think you’re not smart enough, not pretty enough, or simply not enough, there’s so much more that you can do and be if you focus on your dream. These amazing women, and a few fantastic men, highlighted the very important fact that anyone can succeed with the right attitude. It’s all about finding your passion and sticking to it. Whether you’re in Zicklin, Weissman, or SPA, the right career is at your fingertips when you have a positive outlook. For all of the women out there interested in business and/or personal growth, this may be an event for you to check out next year! You too deserve to live a fun and fearless life. 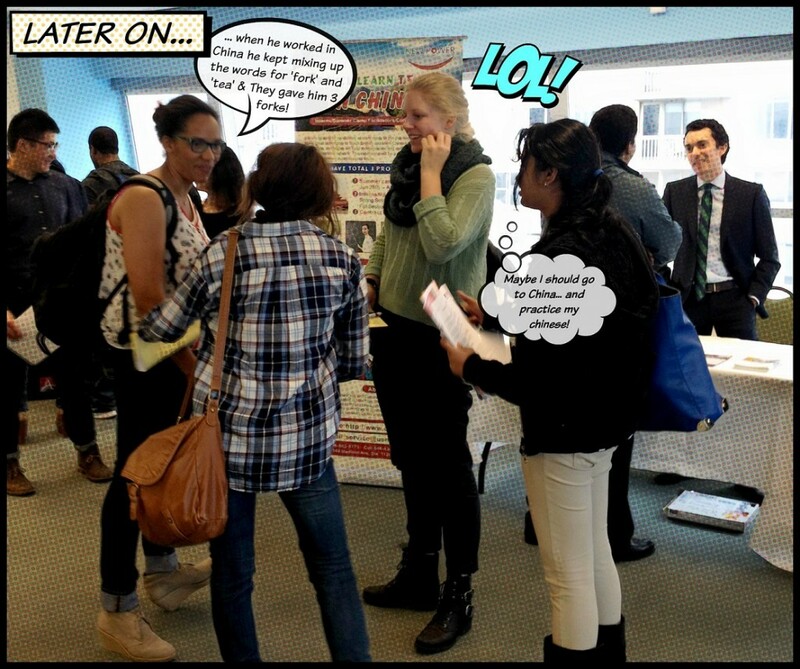 In the meantime, look into Baruch College’s own Women in Business Club and make your mark today! The student blog has recently experienced staff changes and, as a brand new team, we would like to introduce ourselves. Led by our fearless leader and senior staff writer, Yelena; Karen and I will be providing you with informative and captivating stories that will hopefully poke at your interests and keep you coming back for more. Karen is a born and raised New Yorker, who is currently a freshman at Baruch College. With a burning passion for creativity, Karen loves discussing art, music, and other artistic fields. But, her artistic talents aside, Karen plans on majoring in finance, and minoring in management, with the goal of becoming an investment banker. Nonetheless, her imaginative mind is illustrated in her writing, through original ideas, descriptive pieces, and a genuine enthusiasm towards the subject matter. Not only does Karen wish to write about art but her biggest dream is to open up a gallery presenting the work of talented teenagers across the globe. She hopes to share her passion with the world and inspire others to find the artist within themselves. In addition, Karen dreams of one day backpacking through Europe and experiencing all the continent has to offer. While visiting museums, tasting different foods, and learning foreign customs, she hopes to expand her knowledge on various art and culture. Her love for traveling inspires her to write, so make sure you check out her blogs on foreign culture and customs. I am currently a junior studying Computer Information Systems. My interest in technology spurs me to write articles on the newest gizmos and gadgets that big tech firms are developing, as well as popular growing apps and websites that you all might find fun and useful. My goal is to one day perform IT work for a mass media company, such as Disney or Warner Brothers, and design systems that make it easier for users to consume and enjoy media. From a young age, I’d always been interested in the development of movies and how they were brought to life; the writing, direction, special effects, and acting have always fascinated me and sparked my interest in film. As a result, I enjoy writing reviews on movies I’ve recently seen and sharing my opinions with others. Under the influence of many films, I have developed a wacky sense of humor that I like to incorporate into my writing. I try to keep my writing fun and cheerful, as well as informative and interesting. As I am also an avid sports fan, you can find me watching the New York-based sports teams, and debating trending sports news. Unfortunately, I can become angry and frustrated when my beloved New York Yankees lose a few games in a row. Despite our different personalities, all of us here at the Weissman Center have one goal- providing you with the most interesting and informative content throughout the year. As college students, we are usually familiar with study abroad programs- you pay the tuition fees, but go to class in Argentina instead of the 23rd street building. But an aspect of the “abroad” experience that may not be as familiar is the Work Abroad program offered at Baruch. 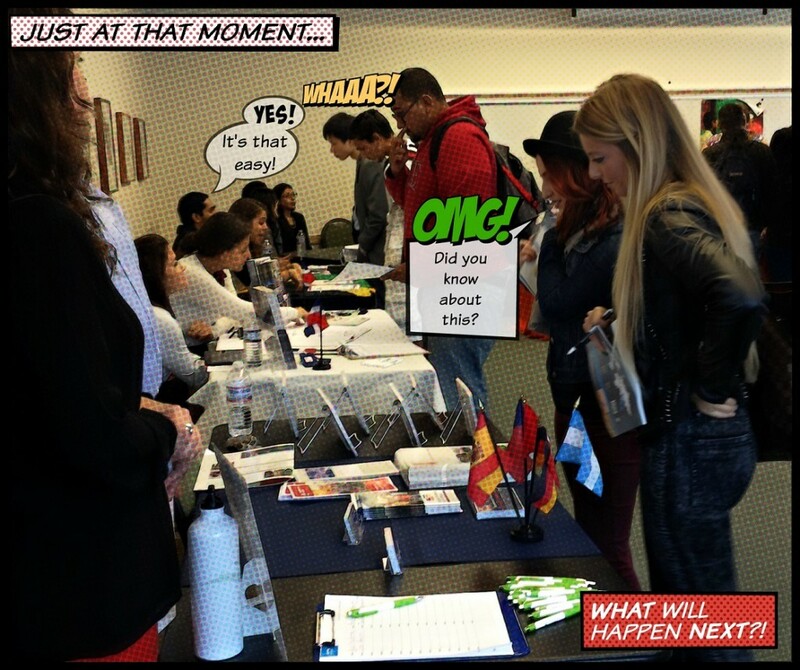 So, in order to learn more, students recently attended the Work Abroad Fair held right here on campus. A variety of students found out what the program has to offer by speaking to experts in the matter who are ready to answer questions and de-bunk any Work Abroad myths. 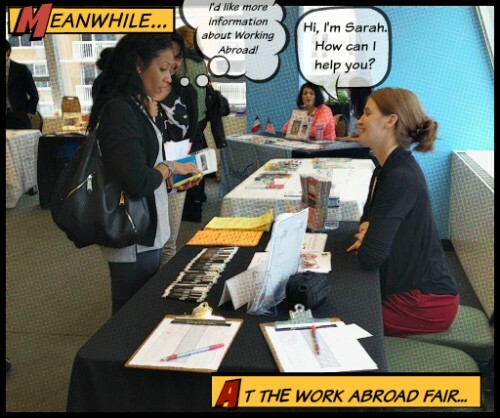 “Students that attended the fair want to improve their resumes and experience new things,” said Sarah Demetz of the Weissman Center for International Business, “they understand how working abroad can change their lives.” Sarah is the work abroad coordinator and a firsthand witness to how meaningful and beneficial it is for students. “In today’s society, any career is an international career, and participating in these programs provides students with experience into this international market,” said Demetz. There are various companies that work with the center that see the advantages in hiring students from all majors- finance, marketing, technical and educational fields (just to name a few). Work abroad experience is a fantastic thing to put on your resume. It sets you apart from the average student, making you a super contender to employees. And with various job opportunities available and a variety of countries to choose from, the possibilities are endless. Whether you work abroad during your winter or summer break, for 4 weeks or 3 months, the benefits outlast the length of time you travel. In fact, students have memorable experiences due to the fact that they don’t go as tourists; they work and interact with the people daily- truly immersing them in the culture. This type of hands on experience is a life-changing experience that’s not only beneficial to your career but also your self-development. 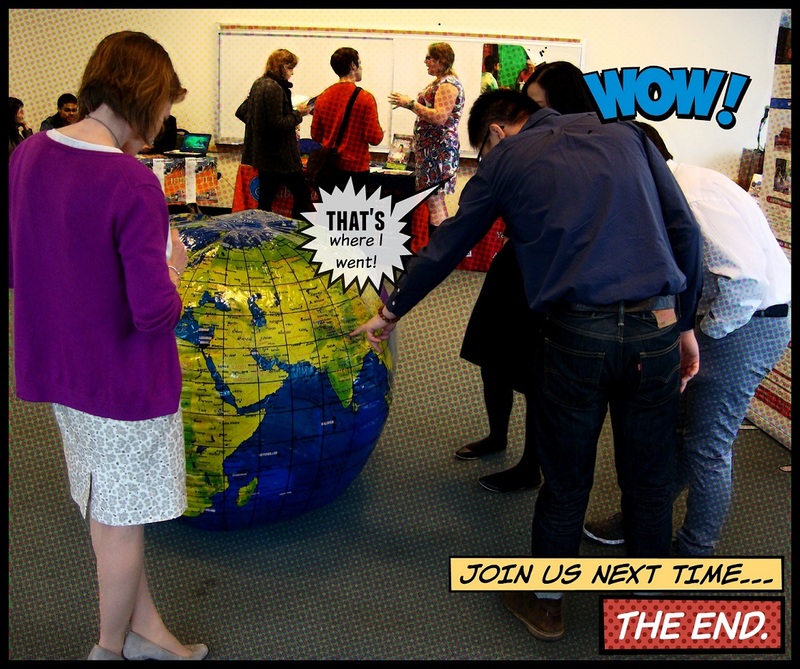 Are you ready to discover your super powers and work abroad? If so, swing by the Weissman Center for International Business located at 137 E. 25th Street on the 8th floor and make an appointment with Sarah Demetz. Be on the lookout for the Weissman Center’s many fairs and events, and come see what else we have to offer; from Study Abroad to the Internship Program, we have something for everyone. 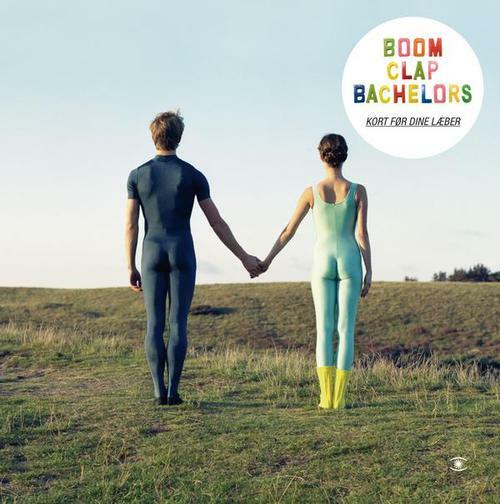 The Boom Clap Bachelors is a group of musicians, producers, and DJ’s originating from Denmark. 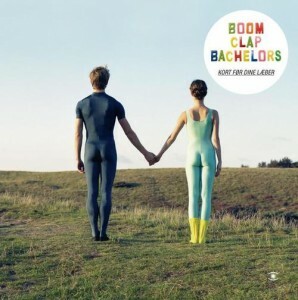 They’re fairly new to the scene, since they released their first single in 2008, but their music has already been featured in one of Kendrick Lamar’s songs and they’re only moving ahead from there. If you’re curious, you can check out their Facebook Page for more information. With its minimalistic composition and mellow attributes, it is the perfect song to accompany you on any night in or on a midnight drive. We are located on the 8th floor of 137 East 25th Street, between the library building and the welcome center. You can also give us a call at (646)-312-2070 or Email Us!